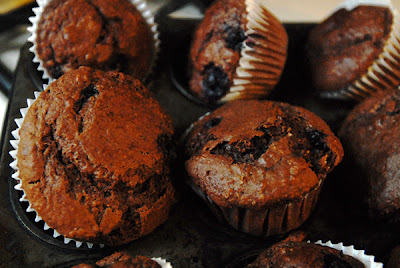 Chocolate Blueberry Muffins Recipe for Autism Awareness Day. This is the first of two posts in response and support to a great campaign being run at the moment being (Light It Up Blue)This campaign is to raise awareness of Autism let me just share this snippet with you. Autism awareness day is on Saturday, April 2. “Light It Up Blue” is a campaign designated to spreading Autism Awareness. So many of us are touched by Autism is one way or another. This is because currently 1 in 110 children has been diagnosed with autism (CDC). Being a mother to two boys, the next fact strikes a particular chord with me. 1 in 70 boys is diagnosed with autism (CDC).This great cause was brought to my attention while surfing the net and checking out some friends post, one of whom is Katefromscratch please visit her blog she has some really nice recipes and is doing a fine job in raising awareness for Autism, all so to find out more about Autism please use this link.Thanks Guys and girls and please support this cause. Now then this recipe is a wonderful combination of both fruit and chocolate and I'm sure you will all love it. approx. 1/4 cup semisweet chocolate chips, melted"
1.Preheat the oven to 375 degrees F and grease 12 muffin cups. 2.In a medium-size saucepan, melt the butter and unsweetened chocolate over medium-low heat until smooth. Remove from the heat and cool slightly. 3. Stir in the sugar, egg, buttermilk, and vanilla. In a large bowl, whisk together the flours and baking soda. Gently mix with the liquid ingredients. 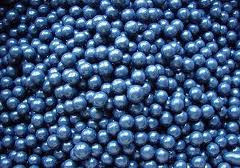 4.Fold in the blueberries. Spoon the batter into well-greased muffin cups, filling to the top. Bake for about 25 minutes.5. Cool on rack. 6. Drizzle the cooled muffins with the semisweet chocolate. 7.Allow to set at least 15 minutes before serving. The bottom line is that indulging in a small amount of dark chocolate might be the perfect dessert - satisfying your sweet tooth while treating your body to the many health benefits of chocolate. So next time you're craving dessert, reach for the dark chocolate, and hold the guilt. Hi Mac! Thank you for coming to my site - otherwise I wouldn't find your delicious site! I love chocolate...(I tell everyone I'm recovering chocoholic, but I can't stop eating chocolate). I'm not a good baker, and haven't started to try baking much, but I do enjoy eating and looking at all kinds of the sweets. Anyway, it was nice to meet you, and I'm looking forward to your new post! and I now have a subscribe by email button for anyone who wishes to follow by email and really nice to meet you to and I'm looking to make more time to try some of your recipes. Yum! Chocolate and blueberries is a combo you don't see very often but it sounds wonderful. Nice twist instead of strawberries or raspberries. These look decadent!